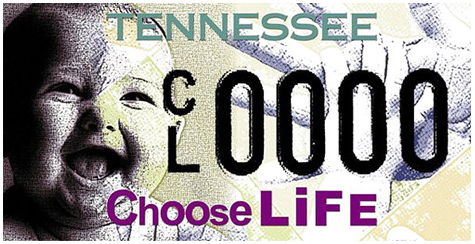 Click here for information on obtaining your own Choose Life plate.Welcome to the official homepage for Tennessee’s Choose Life plate. We are grateful for the enthusiastic support of Tennesseans from every walk of life, support which continues to make Choose Life one of the bestselling specialty plates in our state. Within this site you will find information about New Life Resources, our partner agencies across the state, and other ways that concerned Tennesseans can make a difference to promote adoption and life-affirming efforts in our communities, state and nation. With just a click, you will find details to help you in obtaining or renewing your own Choose Life plate. We invite you to share the powerful Choose Life message with your friends, family, classmates, co-workers and church members. Let’s each do our part to support abortion-vulnerable women and families while positively advocating the protection of innocent human life in Tennessee.